Many parents would have recently read about the death of a young man at Schoolies on the Gold Coast. The 18-year-old from Sydney died after falling from a balcony of an apartment and, according to reports, had been drinking with friends and apparently ingesting nitrous oxide. The use of nitrous is better known as 'nanging'. Although there has been no confirmation by authorities that nitrous had indeed been used by the young man, the media leapt onto the story and, as a result, there have been lots of questions asked about 'nanging' and just how big a problem this is amongst our young people. If you want to know if young people are nanging in your area all you need to do is walk through your local park early on a Sunday morning before the cleaners have been and take a look around the rubbish bins or the trees. If it is (and to be honest, I don't think there are many places around the country where it isn't! ), you're more than likely to see a number of used balloons and crushed-up silver bulbs strewn around the ground. What teens have been doing the evening before is emptying the contents of the bulbs into balloons and then inhaling the gas in an attempt to get a quick 'high' … They can either purchase these over the internet (it takes a quick search of the web to find an Australian-based company that will send as many of these to your door as you wish) or go to a local convenience store (just take a look behind the counter, usually you can see them just behind the lighters - they come in boxes of 10 for around $12). They can also be obtained through social media, with The Daily Telegraph reporting that it took them only two hours to get 100 'nangs' home-delivered via Facebook. One of my best friends has started hanging out with a new group of people and they are messing around with bulbs - they call it 'nanging'. They say it is the same as 'laughing gas' and is called nitrous. I am worried about her, she says that I shouldn't be worried because it is harmless. Is it dangerous and what does it actually do to you? 'Nanging' is a slang term used to describe the inhalation of a gas called nitrous oxide (N2O) from cartridges ('bulbs', 'whippets' or 'nangs') usually used in soda syphons or for making whipped cream. According to UrbanDictionary.com, it's called 'nanging' due to the "repetitive sound distortions induced by its use". The gas is released from the bulb into another container (e.g., a balloon) and then inhaled, usually through the mouth, resulting in a short 'high'. Nitrous oxide has been around for a very long time and is used in surgery and dentistry for its anaesthetic and analgesic (pain-relieving) effects. It is often called 'laughing gas' mainly due to the euphoric effects of inhaling it (even though you may see movies showing people using this gas laughing hysterically, that is not what the gas necessarily does - the term 'laughing gas' relates to the hallucinogenic or euphoric effect). It has been used by some to get intoxicated or 'out of it' for a very long time - with reports of use in this way going back to the 18th century! In addition to the effects already discussed, users say they experience a lack of coordination and disassociation (feeling separated from their body) when they inhale the drug and that is why it continues to be popular amongst some groups of young people. If you take a look around the web you will find lots of discussion around the use of nitrous and bulbs. Some people talk about the fact that because this substance is used by doctors and dentists then it must be safe, whilst others imply that anyone who inhales this gas is going to drop dead immediately! The reality is somewhere in the middle (as it usually is) but it is important to be aware that nitrous is not a safe product to play around with and is certainly not without risks. Even though it continues to be used by health professionals to assist them with their patients, it is used in a very controlled way to ensure safety. There is recent research, however, to say that even when used in medical procedures N2O can be neurotoxic, particularly in the developing brain. Although many young people believe nitrous to be 'harmless', there have been deaths reported due to 'nanging'. These have been caused by the user choking on their own vomit after inhaling the gas and passing out or falling asleep. 'Sudden sniffing death' is also a risk, that is, heart failure resulting from an irregular heartbeat usually caused by stress or strenuous activity after sniffing or inhaling the gas. This is rare but, when it does occur, the user usually has been startled (possibly because he or she has been caught), or has engaged in rigorous activity following the use of the drug and collapse and death follow. Recently we have seen a number of nitrous-related deaths amongst young people in Australia. According to reports, two of these appeared to be caused by the nitrous displacing the oxygen in the lungs of the user (hypoxia), resulting in almost instantaneous death. Once again, this is rare but as nanging continues to grow in popularity, the number of nitrous-related injuries and deaths is likely to rise. Other deaths have been linked to 'misadventure', i.e., the person using the drug has died due to an accident such as falling over and hitting their head or the like. So is this is a significant issue and what do parents need to know about this drug? When I ask young people about this drug, interest appears to have grown mainly due to social media, particularly via Instagram and Snapchat. 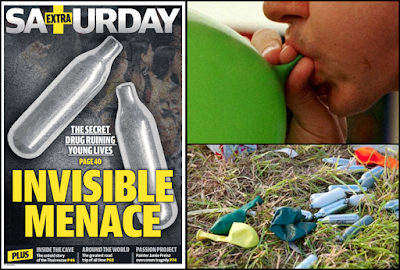 Teens openly talk about sharing images and short videos of themselves and their friends nanging and, as a result, the use of nitrous appears to have become normalised, i.e., "it's 'harmless fun' and just what you do when you go out." As already said, nanging has been around for a long time (it was first synthesised in 1722 and used at so-called 'laughing gas parties' almost a century before it started to be used in medicine or for whipping cream), realistically, it's not likely to disappear anytime soon. My concern around nitrous, however, is that it has recently become far more normalised amongst young people and regarded as 'harmless fun' - in my experience, when that starts happening you are more likely to see tragedies occur. To be honest, I am surprised that it has taken this long for an apparent nitrous-related death to hit the media (I have been contacted by four schools in the past 18 months that believed they had had a nanging-related death in their community - two due to misadventure and the others as a result of hypoxia). Due to the ease of access (without a doubt it has never been easier to get this drug), the guaranteed 'bang for your buck' (it is relatively cheap and quality is not an issue here - you get what you pay for) and the constant on-line buzz via social media about its effects, nitrous is not going to go away anytime soon. Having a conversation with your teen about nanging, or at the very least saying the word and looking for a reaction, is important. Most importantly, if you do discover your child or their friends are using the drug, keep calm and then talk through your concerns. Don't overstate the risks - remember, death is not likely here but make sure they understand that nanging is not risk-free.